A student and professor teamed up recently to host a daylong organ donor registration drive that supports a statewide initiative encouraging people to give the gift of life. Taylor Clarke, a junior journalism major, and Christine Zammit, assistant professor and academic coordinator in the Physician Assistant Studies program, spearheaded the effort after having experienced the lifesaving benefits of organ transplantation in their own lives. The fall drive was part of the fourth annual Organ Donor Enrollment Day in New York, where a patient dies every 18 hours waiting for a transplant. Only 33 percent of residents are registered organ donors, according to the nonprofit LiveOnNY.org, co-collaborator of the Hofstra drive. “What people don’t know about me is that I have had seven heart surgeries and came very close to losing my life just three years ago,” said Clarke, who suddenly became ill at age 19 with end-stage heart failure. A mechanical pump kept her alive in the hospital until she received a heart transplant after spending five months on a regional waiting list. Zammit’s sister, Katy Monte, 34, was born with cystic fibrosis and has had three organ transplants over the last seven years – double lung transplants in 2011 and 2015, as well as a kidney donated by Zammit in 2014. “She would not be here today were it not for those donations,” said Zammit, who added that her sister, a nurse, is now doing well. 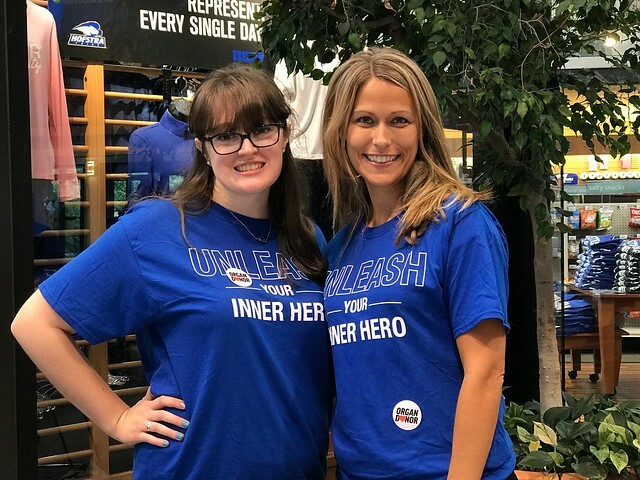 Clarke reached out to Zammit last spring after she saw a social media post by the Physician Assistant (PA) Studies students about Blue & Green Day, a national initiative that encourages the public to wear blue and green in support of organ, eye, and tissue donation. 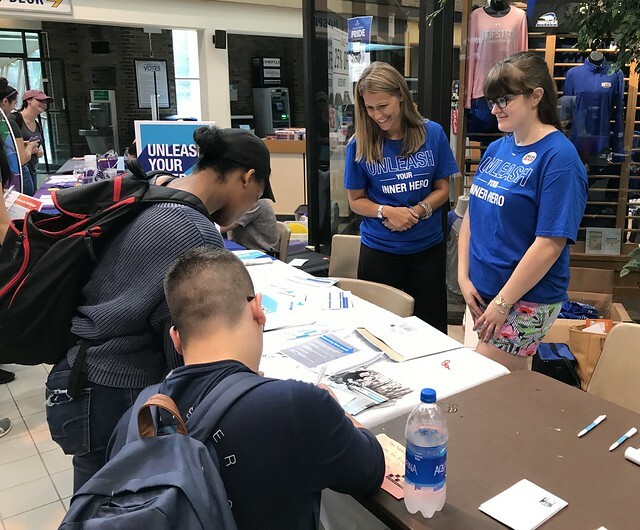 PA students were also on hand to answer questions and help visitors register during the Oct. 10 drive, held in the Student Center atrium. Anyone over the age of 16 can sign up to be an organ donor. Online registration takes just a few minutes, and can potentially save the lives of up to eight individuals through organ donation and as many as 75 others through tissue donation.